132. Rubus Arcticus. Dwarf Bramble. This section is from the book "The Botanical Magazine; Or, Flower-Garden Displayed", by William Curtis. Also available from Amazon: The Botanical Magazine; or, Flower-Garden Displayed, Volume I.
Cal. 5-fidus. Petala 5. Bacca composita acinis monospermis. RUBUS arcticus foliis ternatis, caule inermi unifloro. Linn. Syst. Vegetab. p. 476. RUBUS humilis flore purpureo. Buxb. Cent. 5. p. 13. t. 26. RUBUS trifolius humilis non spinosus, sapore et odore fragariae, fructu rubro polycocco. Amm. Ruth. 185. 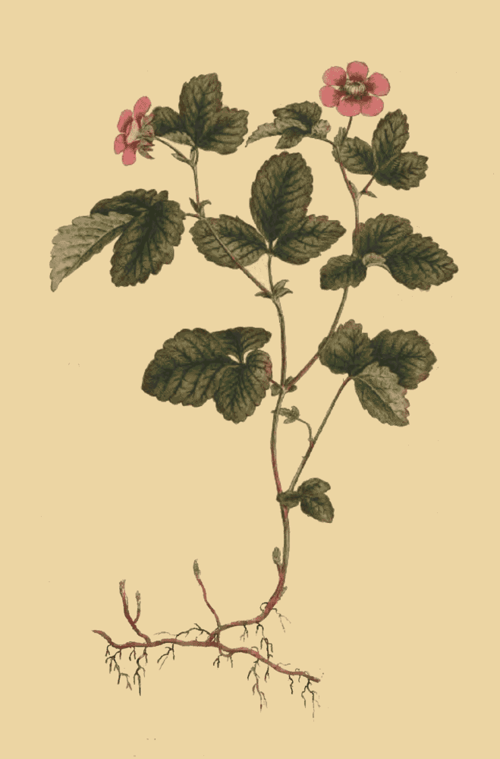 The Rubus arcticus grows wild in the northern parts of Europe and America, in moist, sandy, and gravelly places. Linnaeus has figured and minutely described it in his Flora Lapponica, out of gratitude, as he expresses himself, for the benefits reaped from it in his Lapland journey, by the nectareous wine of whose berries he was so often recruited when sinking with hunger and fatigue; he observes that the principal people in the north of Sweden make a syrup, a jelly, and a wine, from the berries, which they partly consume themselves, and partly transmit to Stockholm, as a dainty of the most delicious kind; and truly he adds, of all the wild Swedish berries this holds the first place. Our figure does not correspond altogether with Linnaeus's description, but it is drawn as the plant grew; culture doubtless made it produce more than its usual number of flowering stems and petals. It grows readily and increases rapidly in bog-earth, on a north border, and flowers in May and June, but very rarely ripens its fruit in Gardens. prev: 131. Catesbaea Spinosa. Thorny Catesbaea, or Lily-Thorn. next: 133. Hyacinthus Comosus. Two Coloured, or, Tassel Hyacinth.